Martin Johnson has dismissed fears for the state of the game in England after a poor Heineken Cup showing by the Guinness Premiership clubs, insisting that his side will be competitive come the start of the Six Nations. The final weekend of European Pool action confirmed Northampton Saints as the sole English representation in the last eight of the top tier competition but despite this Johnson believes that the Six Nations will again be too close to call. 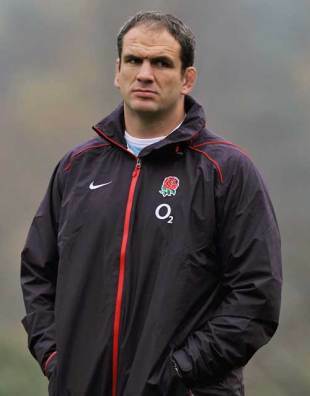 The England manager has his sights set on their opening fixture against Wales at Twickenham on February 6. "In an ideal world we'd have three or four teams there because it is good for the players, but we haven't," Johnson said as the tournament was launched in London. "Some guys have come into camp disappointed from the weekend but they get into England mode very quickly and they are happy to be back together as a group. "Last year the French clubs didn't have a particularly good time of it in Europe but the Six Nations games were very close. This year they will be very close. Last year we lost to Ireland and Wales by a combined total of nine points. Scotland were very competitive last year and they will be a better side this year. It will be just as tight this year. Anyone who predicts who will win the title is a brave guy." Johnson described his current squad as the best that he has had at his disposal since taking over in 2008, with long-term injury absentees Riki Flutey, Toby Flood, Delon Armitage and Nick Easter all back in the fold after sitting out England's miserable November campaign. "The next World Cup is 18 months away and we are building a good squad," he said. "We are starting to add a bit of depth to our group, more than ever before. There is competition throughout and that is what you need. "This is the best squad we have had in my time being in charge and it will only get stronger. "We have a good leadership group and it's the strength of any side that you have three, four or five guys who could be captain. With guys like Jonny Wilkinson, Lewis Moody, Nick Easter and Simon Shaw we are starting to have a core group of leaders."